This test method is used to assess the flammability and flame propagation characteristics of aircraft thermal/acoustic insulation materials exposed to both a radiant heat source and a flame, within a test chamber. The test equipment is also similar to the one used to measure critical radiant flux for flooring systems and for exposed attic floor cellulose insulation, both in the USA (ASTM E 648, ASTM E 970, NFPA 253) and Europe (ISO/EN 9239), where the European Union made the test method one of the requirements for fire test approval of floorings. The radiant heat for the FAA test is normally applied by means of an electrically-heated panel, inclined at 30E, and directed at a horizontally mounted floor covering system specimen. The radiant panel generates a radiant energy flux distribution in the nominal range of 1.0 W/cm2 (at 150 mm) to 0.1 W/cm2 (at 900 mm). This ensures that an incident heat flux of 1.5 BTU/ft2/s (1.8 W/cm2) can be obtained at the FAA “zero” position of 51 mm (2 in.). Alternatively, the FAA test incident heat can be obtained by means of a propane gas-fueled panel. In the FAA test, a small venturi torch with an axially symmetric burner tip and a propane supply tube (0.15 mm, 0.006 in. diameter, 71 mm, 2 7/8 in. long) is used as the pilot burner. In the critical radiant flux test, a different pilot burner is used and the distance burned until flame-out is reached is converted, by calibration, into an equivalent critical radiant flux, in W/cm2. Traditionally, tests are conducted to give a maximum critical radiant heat flux of 1.1 W/cm2, but the tests can optionally be conducted with higher radiant heat input, to obtain critical radiant heat fluxes of up to 2.5 W/cm2. 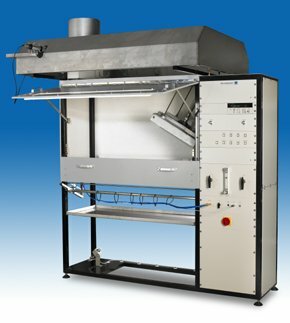 Optional measurements for the critical radiant flux test include smoke obscuration (requiring additional instrumentation in the exhaust duct, available from FTT), and flame spread rate.